I now had a midget that could roll around the garage – and even be steered – at my whim. It was a real gas. But there was more work to be done. 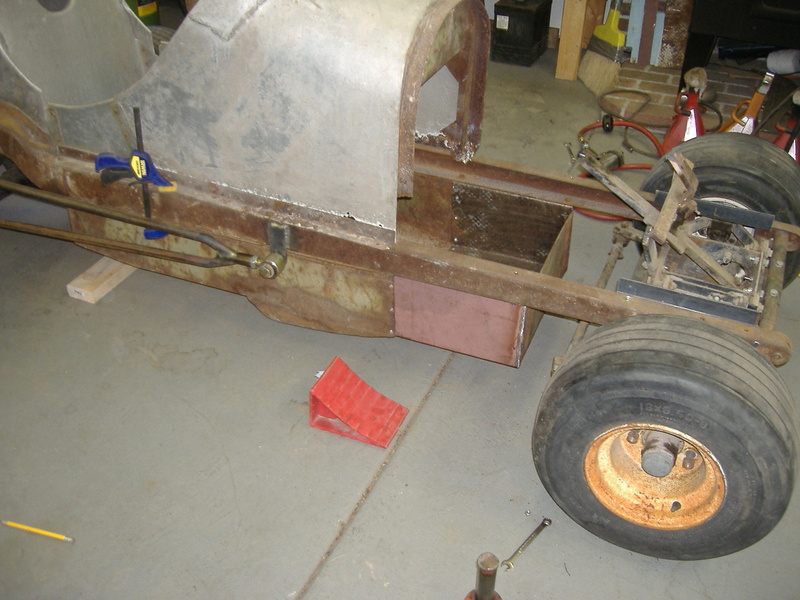 Despite the decision to stay with a patina/rat rod look, there were a few areas of rust that simply had to be dealt with. Mostly, they were structural issues and ergonomic issues. Click it for more exciting metal work. I guess I was tied to the thing with a six inch rope, because I have zero photos of the whole unit. Anyway, the long runners on the bottom of the unit were completely shot. So, using a piece of sheet metal from a ’37 Ford roof I had been saving and my new 36″ sheet metal brake from Harbor Freight, I built some new runners for it to sit on. 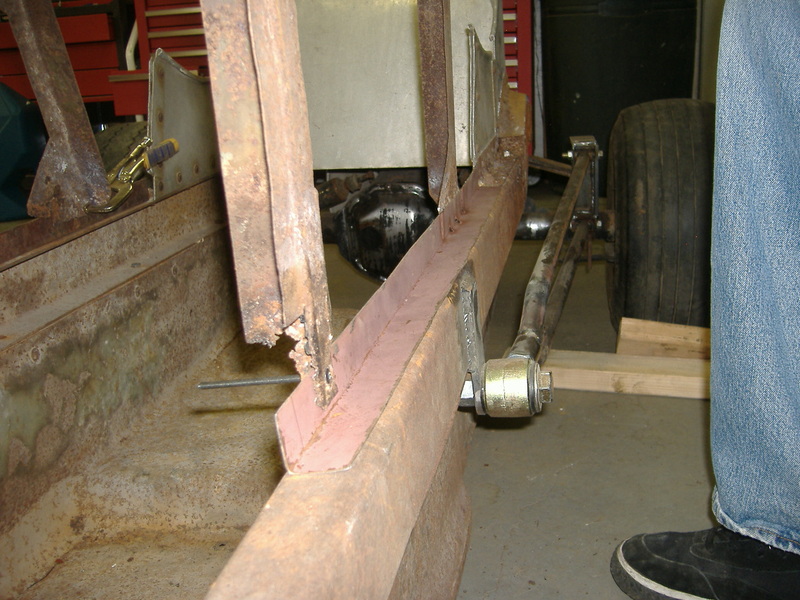 The uprights were rotted pretty bad, so I patched them up as well. The photos below show some of that process. 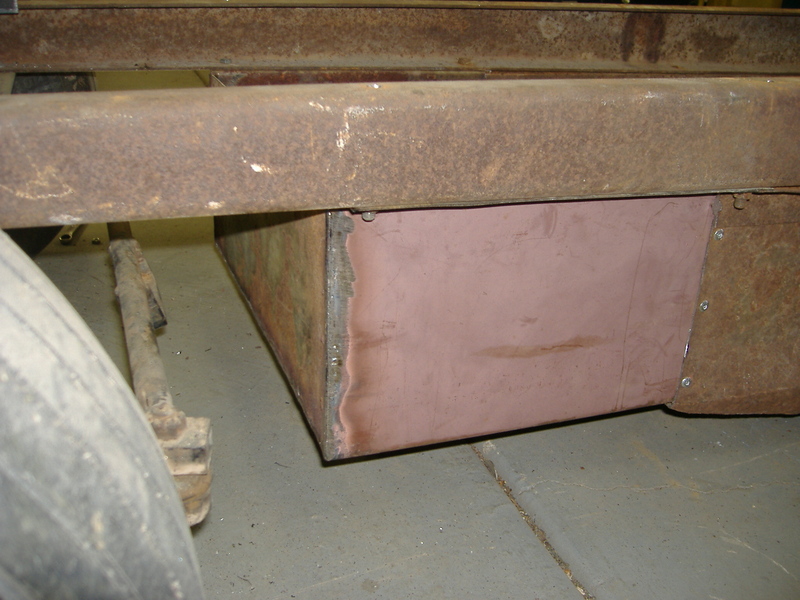 The welding on this part was extremely difficult because the existing metal was very thin from years of attempting to return to the earth. 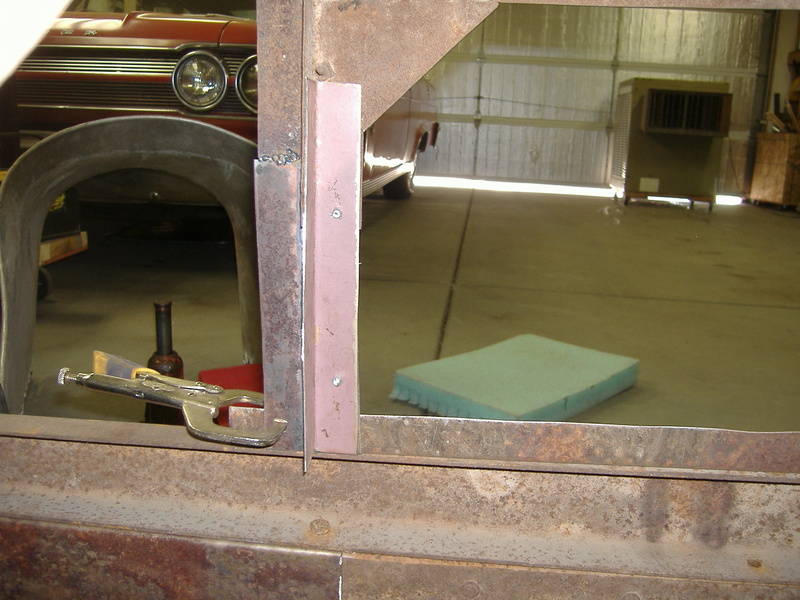 Also, the whole cowl section is made of thin gauge sheet metal, so it was very easy to blow a hole through it. I’m no welder, but I am getting much better. Nowadays, the cowl support is nice and sturdy and doing its job admirably. 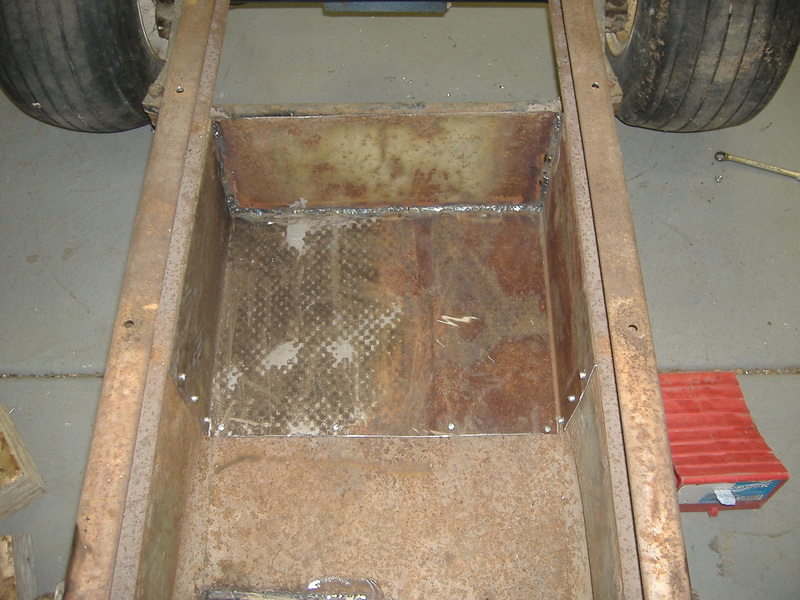 The holes were repaired using two scraps of sheet metal from the golf cart. The blue patch still wears the blue color today. I consider it an homage to the brave golf cart that checked the “Donor” box on its ID. The cool thing about these patches was that the original radii of the bends in both patches matched the belly pan of the midget perfectly. 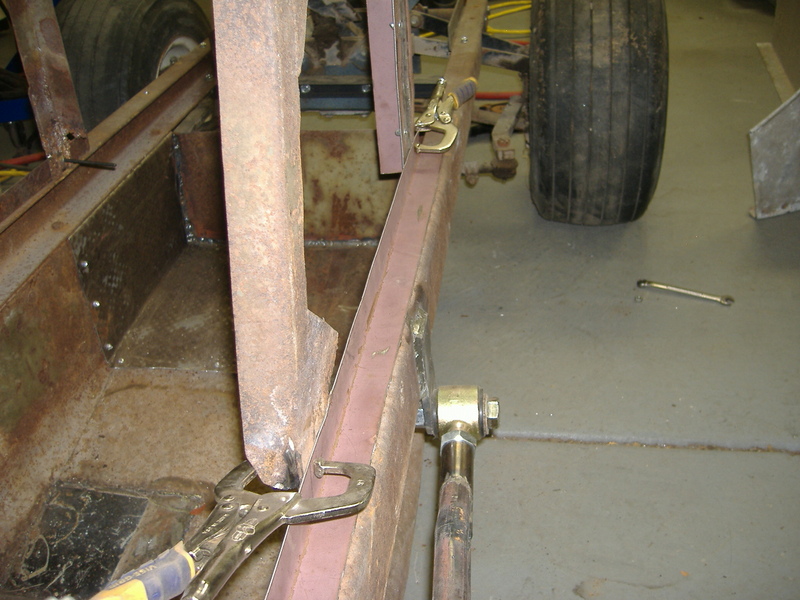 I didn’t do any bending at all – just trimmed and welded. 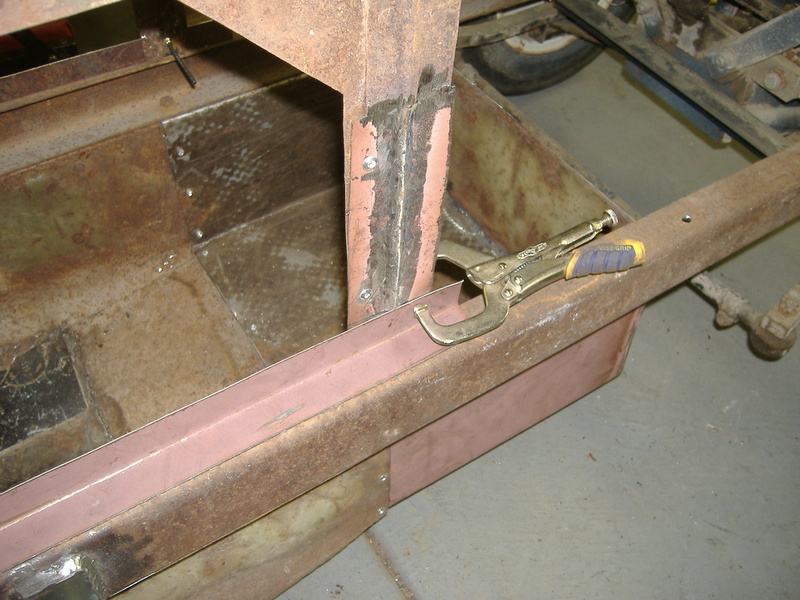 Lastly, and most importantly, I added an extension to the belly pan for more leg room. 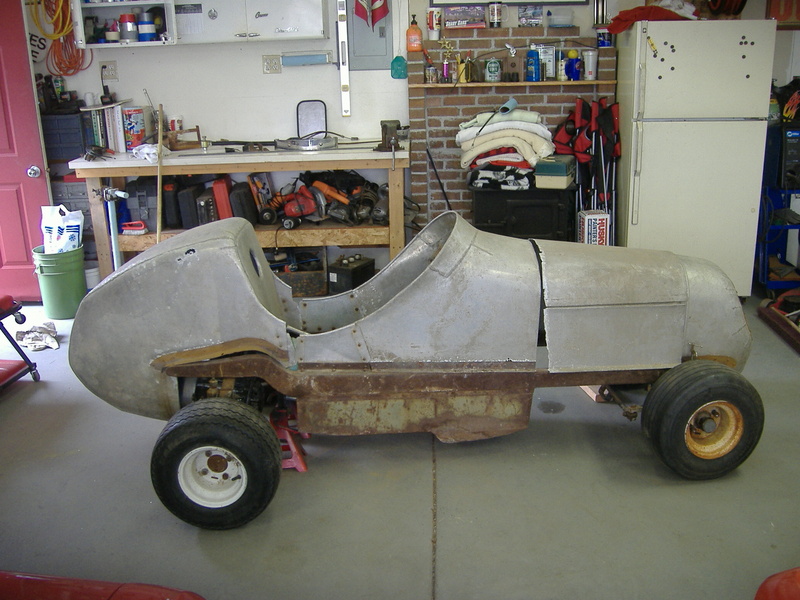 I am 6’5″, which I found out in the mock-up stages of the project, is too tall to drive a midget. 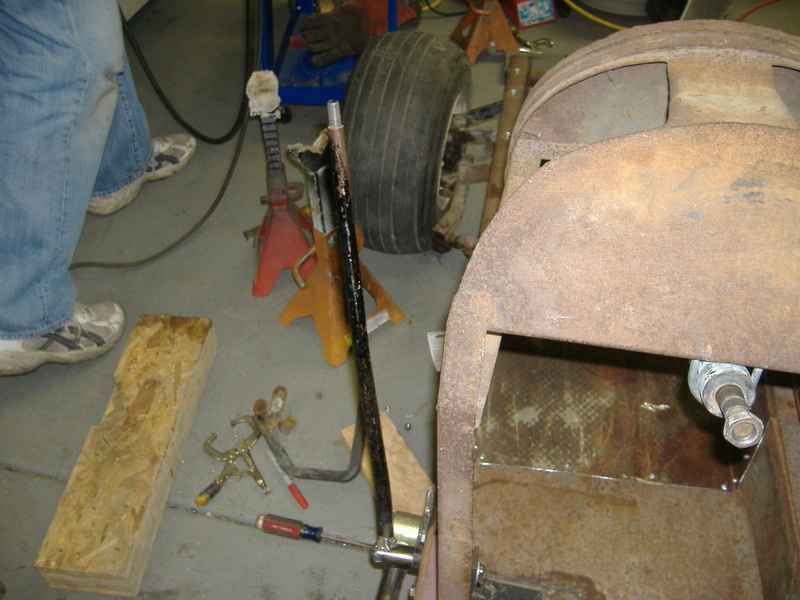 So, another piece of the ’37 Ford roof was used to build a 12″ extension. 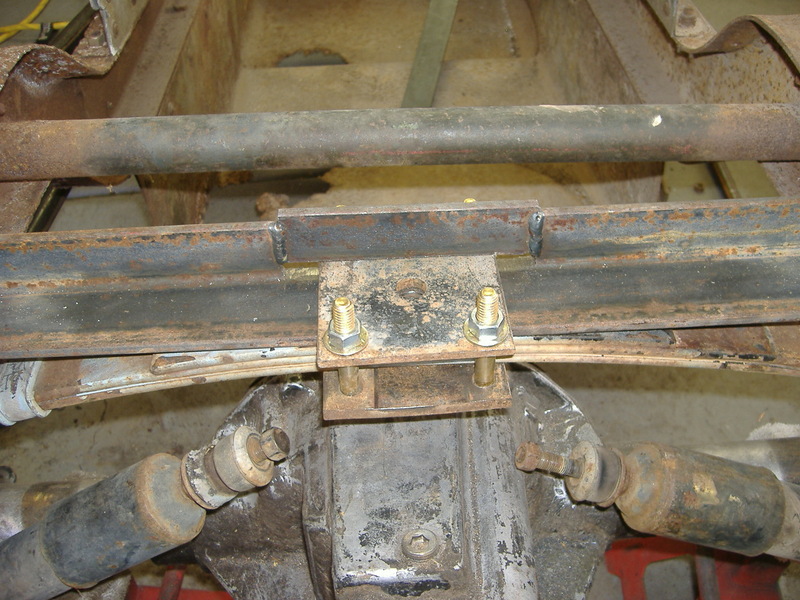 The Harbor Freight brake did its job admirably to achieve the shape and a flat piece was welded across the front. 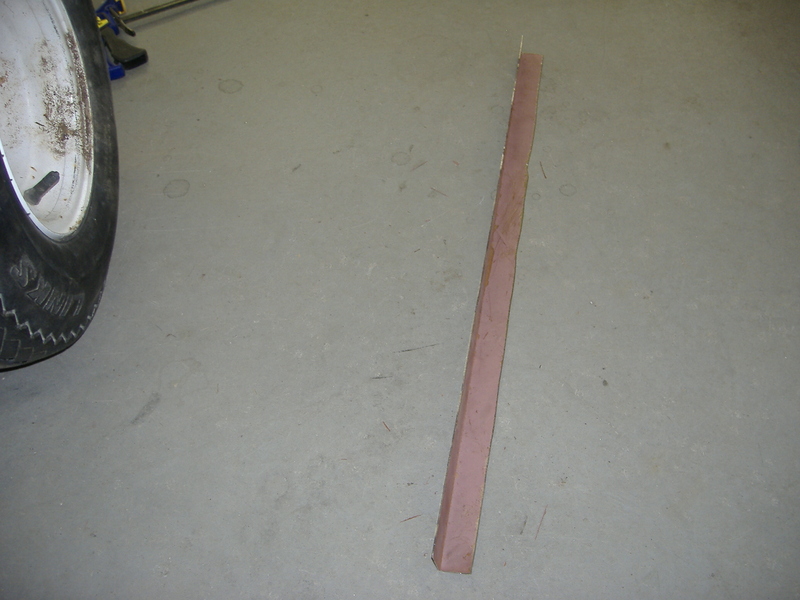 In the photos, you can see the seam where the original meets the extension. That point is about where the oil pan would have ended on a flathead V8. Apparently, people were short in the ’40s. 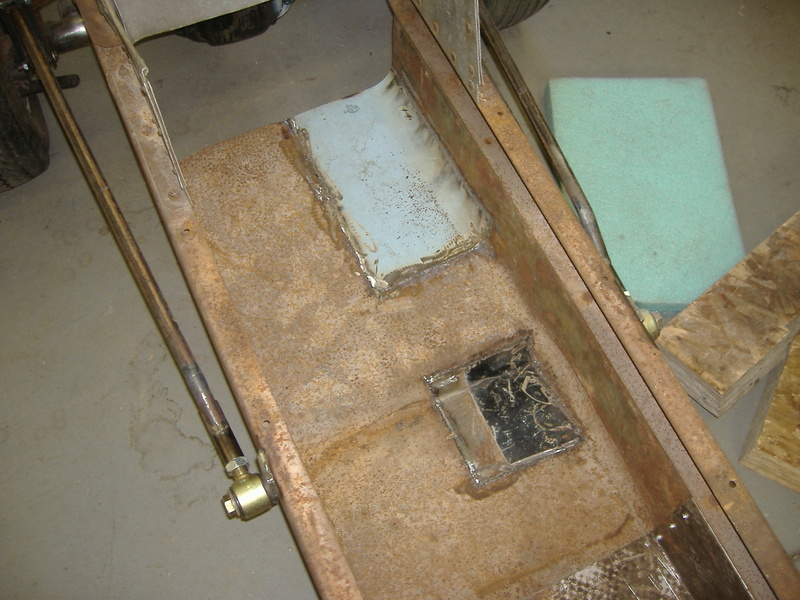 Since there is no oil pan to worry about, the extension takes up some space that looked far too blank without it. You can see this in an earlier mock-up photo below. In the last photo, you can see the new tires and rims that I chose. 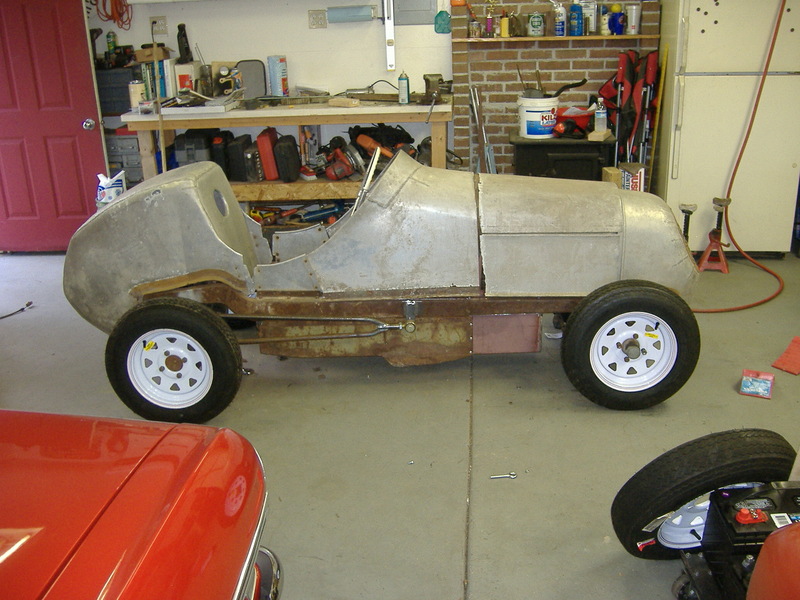 Midget racers of the late ’40s ran on 12″ steel rims and bias ply tires. 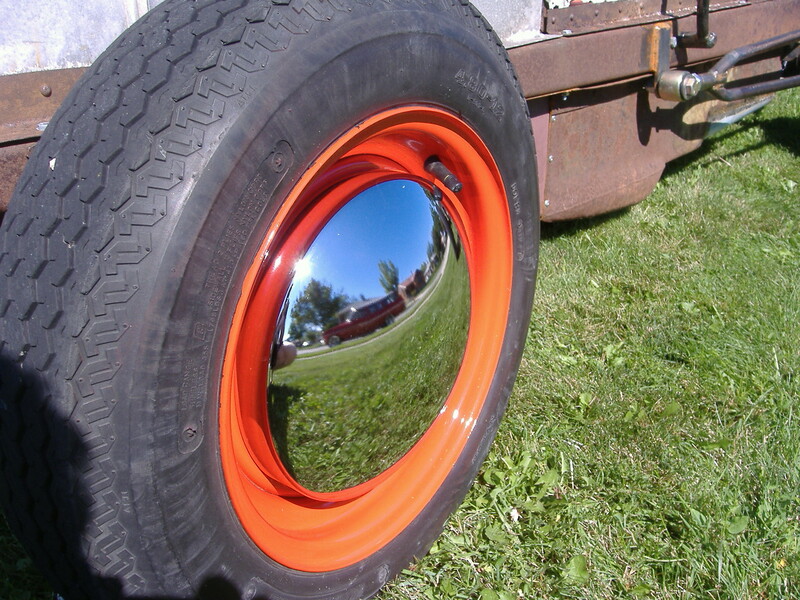 Trailer tires were the simplest solution to achieving that look. The front tires are slightly smaller than the rears. Much later, I did something about the terribly ugly white spoke wheels by modifying them to hold some baby moon hubcaps. They aren’t exactly midget-correct, but I don’t mind claiming a little artistic license here and there. At this point, the midget pretty much looked like what the finished product would look like. It was getting exciting. A much needed aesthetic upgrade. Again, awesome! Wish I had the skills, patience and space to tackle a project like that. This project was more a test of my imagination than any of the items you mention. There were a lot of parts that needed to be mounted some specific place, and we had to figure out some crazy bracket or something to get them there. I now have a greater respect for fabricators in general. Wonderful project! Was it very difficult for you to find rims with the same bolt pattern? I’m working on a project using the front end wheels and suspension from a 4 wheeler and i’m trying to find lighter street wheels for it. It was really easy for me. They are just 4 lug trailer tires from Harbor Freight. They luckily just bolted right on.